The Border Collie is a medium sized dog breed which was bred in early Britain to help herd sheep. 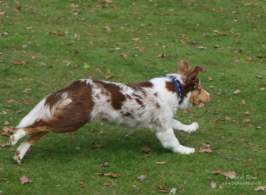 The breed is extremely intelligent and has a strong working drive which makes the breed easy to train and highly skilled in many agility sports. 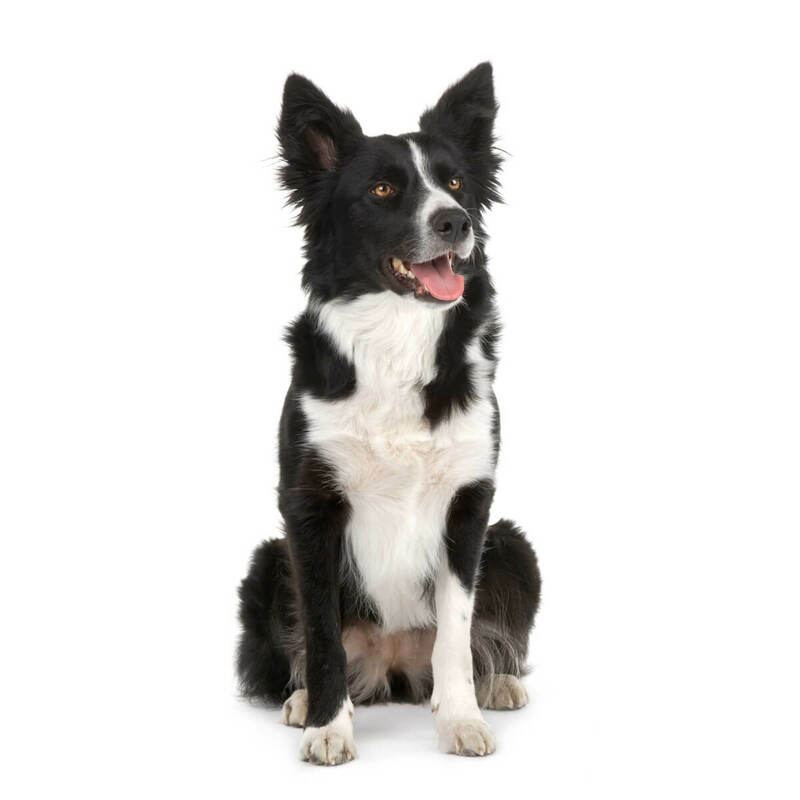 Border collies have high energy and stamina with a workaholic attitude. They need both mental and physical tasks to keep them occupied, so if you're looking for companion to relax on the couch this is not the breed. Because of this the breed is recommended for active owners and is ideal for anyone interested in agility sports such as frisbee throwing and agility courses. Border Collies are neither for the meek nor the he lazy. These are wonderful dogs whose small body should not be underestimated. Originally bred to be a herder in the harsh climes and chilly habitat of northern Britain, they soon became appreciate for their hunting prowess. Despite these wild activities that required astounding stamina, cleverness afoot, and remarkable strength, these dos could come home and stay in the house with the family. Still, they are not at all the best dogs for first-time dog owners as they need loads of training, great patience, and careful handling despite their hyperactivity, although they aren't dangerous. If you insist on getting a Border Collie as your first dog, however, be sure that you are prepared for the many health problems with their legs and back. 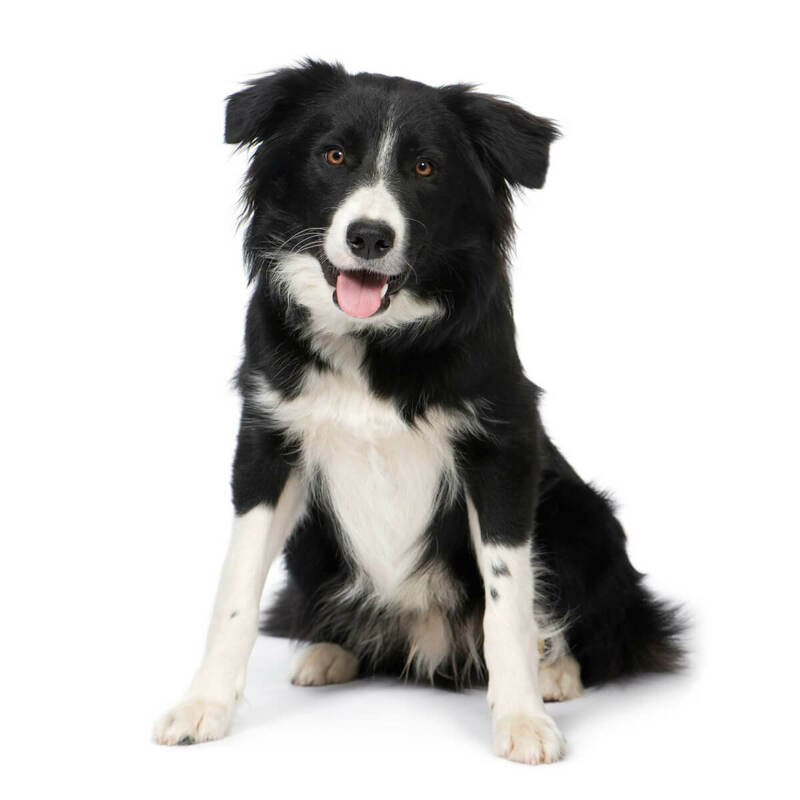 As a medium sized dog breed, border collies weigh between 30 to 45 pounds and are 18-22 inches tall from ground to shoulder. Their size is small enough that they are agile and perfect for most apartments and condos, but large enough that they are sturdy unlike smaller fragile breeds. Border collies are a very intelligent dog breed. It is important that owners keep their dog mentally entertained with tasks, tricks, and other activities to prevent the breed from entertaining themselves with unwanted or destructive habits. Even though border collies are easy to train, they can be stubborn at times and can be a bit shy toward strangers. Because of this it's recommended to socialize them at a young age. The breed does get along with children and other pets, but they may attempt to herd them which may upset smaller kids. The border collie's coat is fairly easy to care for. It is weather resistant and doesn't shed heavily. It is recommended to brush the coat weekly to prevent it from becoming matted. The breed has high exercise requirements and will require multiple walks daily (especially if an inside dog) to meet their exercise needs. Lack of adequate exercise can lead to hyperactivity. The origins of the Border Collie goes back to the time of the Romans when they were in Britannia and apparently exported the dogs early on. As the green hills of England were best used for herding, the "Border Collie" was perhaps the best dog for maintaining such stock. They are very vocal dogs whose ability to communicate is integral to their history, personality, and value. The Romans also took sheep and other animals that required herding. 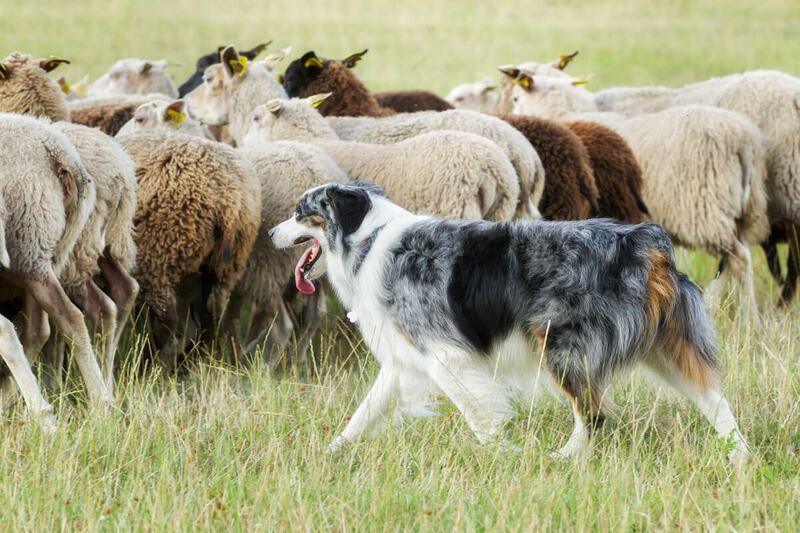 Over time, the sheepdogs that later became the Border Collie emerged both as a breed as well as a great dog for herding. Many centuries later, they had become natives of the land and were famous for enduring the cold climate, windy hills, and many predators seeking to fatten their stomachs with the livestock. In the 16th century book, De Canibus Britannicus (Treatise on Englishe Dogges), the author, Johannes Caius, wrote of the "Shepherd's dogge" when he wrote about the breed whose trainability was managed with "his masters voyce… [and] whisteling." These qualities are well-known to be how these dogs are commanded from far away and remarkably out of sight, and the control over them this way is the foundation of this breed's field trials. It was not until the 19th century that these dogs were formally recognized as the breed we know them today, however, especially in name. 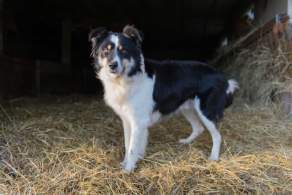 The father of the breed is Old Hemp, who in Northumberland just before the turn of the century emerged from the sheepdogs to be a Border Collie. The name took a couple more decades, and in 1915 the International Sheepdog Society (ISDS) conceived the breed name Border Collie. The American Kennel Club (AKC) formally recognized the Border Collie in 1995. They are classified in the Hunting Group. 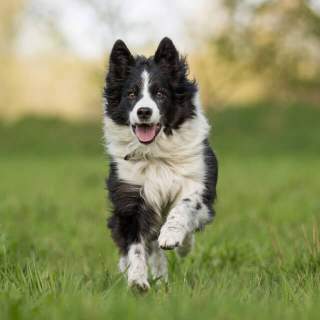 The Border Collie is medium-sized dog whose strength is subtle and yet obvious: it's in their confidence as they stride about assessing everything and knowing that they can control the movement of most living things. They are remarkably alert, extremely intelligent, and always ready for action. If you are singled out by "the eye," you may have heard how it's a mesmerizing, almost hypnotic effect! While their eyes are the most piercing part of this breed, you'll also notice the long, pointed muzzle, the medium-sized and nearly always pricked-up ears. The basic flatness of the skull lends the head shape a firm strength, even if the ears are bent forward in a state of apparent rest. They have a straight-up scissors bite and should have no overbite or underbite. The neck is moderate in length but significant in its strength. The small body will appear larger than it is as the saddle of thick coat hair will drape down slightly over the broad torso. The legs are short and may appear too short but are well-suited for the work these dogs do. The forelegs will seem spindly as they are mostly hidden by the coat. 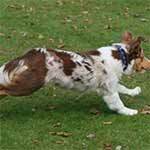 The rear legs are muscular and, like the forelegs, covered for the most part by the dog's hair. The small paws are different in size from front to rear, with the rear feet being slightly smaller than the front. Still, they have deep, heavy pads for their herding work, and they have dew claws too. The tail is medium in length and tends to be carried low for balance, hard turns, and jump-starts. The tail is not docked. 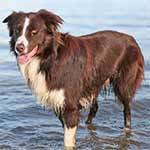 You'll often find Border Collies with the rough coat, but the smooth coat is not uncommon. Both styles are doubled, meaning there is a coat of guard hairs and then the downy-like undercoat. As these dogs are not given to fads, the style is less about the look than about how they work, and the work is hard for those in the field. Still, you may see some feathering in a stylish fashion on some of these dogs. Border Collies come in a great many colors. 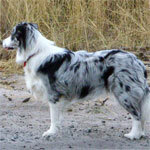 Technically, this breed is white with patches or spots of color. They come in many color variations as well as several patterns and markings. There are not as many rare colors as you may have been led to believe, but there are some. 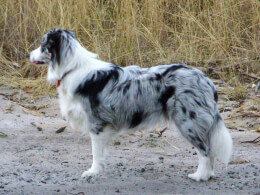 Perhaps the one that is the somewhat rarest is the extremely white Border Collie and which has few markings. There is also the very infrequent solidly colored Border Collie. Good luck on finding one of those! A couple other rare colors are the brindle and lilac dogs, but you may see them more often as time goes on. 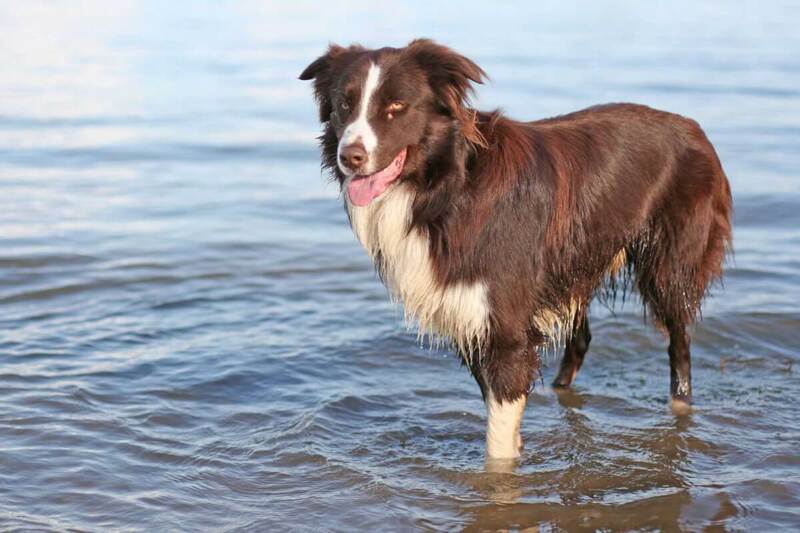 Some people say there are seal Border Collies, but there seem to be few out there. As for sable and sable merle, this color can happen in puppies but will grow out as they mature. You shouldn't confuse the very rare pure white Border Collie with an albino Border Collie. Albinos truly have no pigment, and the sure sign of one are the pink eyes. The most common color is the one preferred by the shepherds who have long maintained the breed: black and white. You'll also often see red and white, tri-colored with red, white and tan, although the red is actually brown, liver, or chocolate that is lightened by the white. Red merle is not too common but is not rare, either. Blue and grey is less common as are those patterns with them such as merle, saddle, and so forth. There are also yellow and white ones, those with fawn that may be seen in two-color and tricolor, those with wheaten, blonde, or gold, and the occasional calico Collie. Some of the patterns for this breed are ticking (also called mottled), the aforementioned saddle, and the half-white face or even faces with all white and the ears in black. The Border Collie adult size is not much despite the amazing energy, stamina, and strength of this breed. They don't get big but they behave as if they are! Males stand around 19 to 22 inches high whereas females are only slightly shorter at 18 to 21 inches. As for the typical Border Collie weight once they are full grown, females average 27 to 42 pounds. Males are a few pounds more with a range around 30 to 45 pounds. These dogs sometimes look wider than they are tall, but they all have somewhat long bodies. 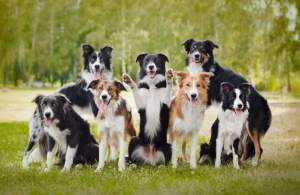 When it comes to varieties of the Border Collie, there is much heated debate. The kennel clubs, which have an emphasis on looks, have prompted a lot of possible advocates of coat and color variety. Those who have long appreciated the Border Collie for its original purpose, however, claim that cosmetic variations are to be ignored as breeding for looks usurps the purpose of the dog, which is to work hard, smart, and long. Still, there is no doubt that there are at least two significant varietals defined by the coat style. Called rough and smooth, they are alike in that both are double coats. They are different in that the rough coat has the longer hair with significant feathering on the legs and underside. The smooth coat is shorter and has less feathering. Oddly enough, the smooth coat only looks so. To the touch, the "smooth" coat is actually rougher in texture. There are no "long hair" Border Collies but the rough coat Collies might be called this because their coat hair is relatively longer. While some people may refer to the smooth-coated variation as the "short hair" Border Collie, this is not the case so much as the comparison with the rough-coated ones. It's not unusual for regional descriptions to become seemingly other variations of the two primary ones, but be sure to understand the two basic varieties first. There are also miniature Border Collies, and the breeding of such dogs is heavily frowned upon by true dog lovers and breeders. To get a mini or toy Border Collie, the use of cross-breeding, dwarfism, or breeding of runts is required. If crossed, then the puppies are not purebred and are therefore no longer Border Collies. If breeding runts or the advocation of dwarfism is used, then these may be purebred Border Collies but they are made miniature by promoting disease. This is, hands down, simply wrong. The Border Collie temperament is not an easy one. These dogs are overly energetic and high-strung if neglected, need a lot of daily and vigorous exercise, and are perfect when their needs and wants are met. They are extremely intelligent, and they can be trained to do an amazing amount of work, tricks, and exercise. If you ignore their desire to learn and use their smarts, you'll soon find them gone, as one of their internationally known characteristics is that they are infamous escape artists. Even as puppies, these dogs are on the lookout on how to get afield and run wild, watch for predators, and to — you guessed it! — herd things. They are known to dig, jump, scamper, shimmy, and unlock latches they've watched you operate. Turn your head to take some tea, and when you turn back, your Border Collie will be free may as well be this breed's motto. Despite all the frustrating mannerisms of these dogs, their tenacious traits and temperament can be trained and redirected to gainful employment, great affection, and remarkable loyalty. It's easy to calm a Border Collie into being this way by making sure they have plenty of socialization, exercise, and room to roam. These dogs are somewhat shy, and they may not be overly friendly to strangers and new friends. You should be sure to not let their shyness turn to fear-based aggression, however, so they should be socialized a great deal. This can be done while fulfilling their daily exercise walking, running, and playing. And when they are outside pursuing their activities, they should never be unrestrained as they will almost never resist the urge to herd anything that moves: cars, bicycles, children, geese, napkins blowing in the wind, etc. Finally, if you get caught by "the eye," don't get transfixed. This means that something's afoot, and you don't want to get mesmerized into something that allows her to get away or start doing something that will lead to escape, trouble or worse. This breed uses their stark stare to get animals that have strayed back into the group, and it's a powerful look. When it comes to kids, Border Collies are not always the best family dog. If you have young children, babies in the house, or toddlers about all the time, you would do well to not add a Border Collie to the mix. These dogs have lots of admirable traits when it comes to field, farm, and ranch work, but those same traits can cause havoc when in a home setting with little children. Because these dogs are stubborn, smart, and not to be denied, a child can easily be bitten if they refuse to heed these dogs. Whether because of the herding instinct, shyness that has turned to fear, or a hyperactivity caused by neglect, the possibility of a young one being bitten by a Border Collie is well-known to be high. 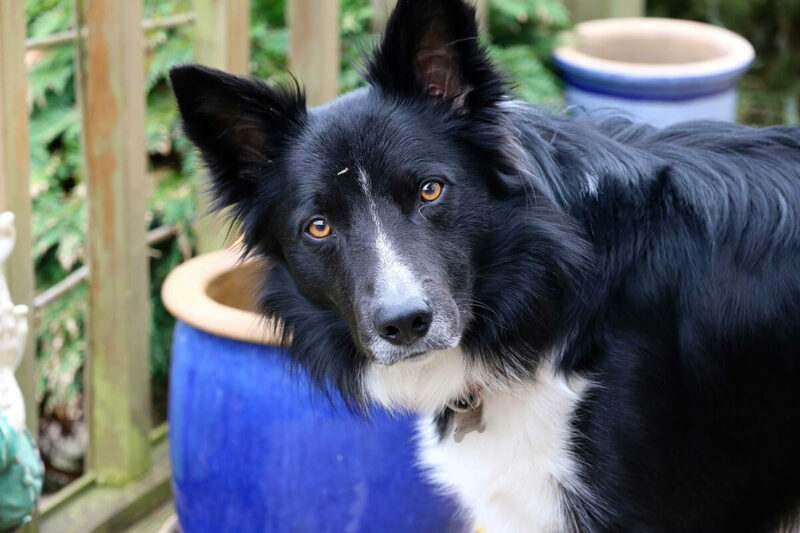 For families with older and mature children, a Border Collie can make a good family pet, however. There is much less chance of behavior that can prompt the dog to be aggressive, unintentionally or otherwise. 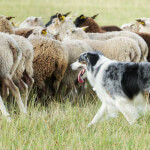 The herding instinct is a strong one with this breed, and these dogs will rarely hesitate to get unruly, loud, or even playing kids into line. 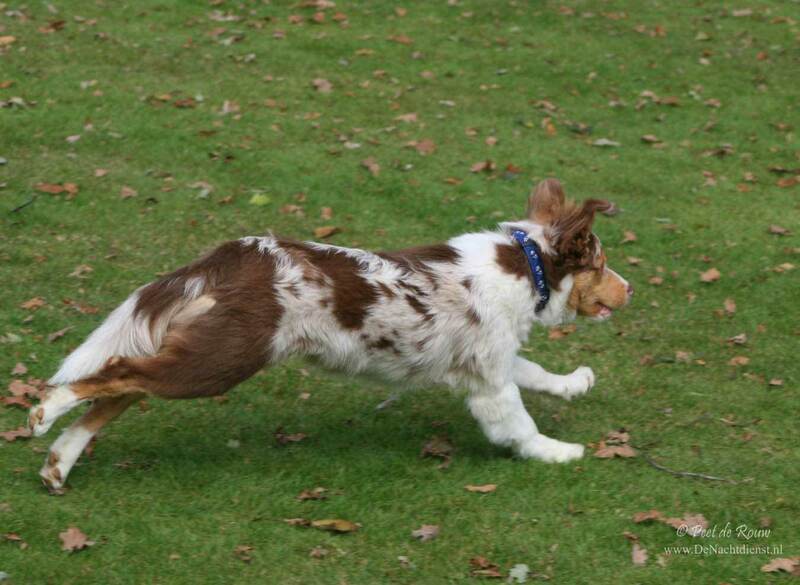 If the child runs, you can be sure he will be seen by the Border Collie as a straggler who must be nosed, nipped, or even bitten back into line. While an enormous amount of training of the dog and the kids can possibly prevent this, it's best to avoid the nearly inevitable accidents and get a different dog. Below are pictures of the Border Collie dog breed.